FANBOY PLANET.com . : mc-D23 :. 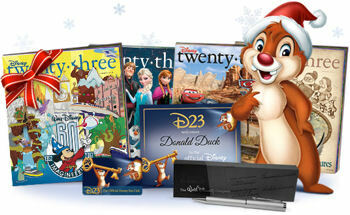 Disney Fans -- How About This For Christmas? Thanks to Disney's purchase of Marvel Comics a few years ago, our fandoms have collided. Actually, walk around Disneyland sometime and you'll find that Fanboy Planet readers fit right in -- there's a strong melange of Doctor Who fans (I've had interesting Whovian conversations in New Orleans Square), Star Wars fans (of course), superhero fans, musical fans and of course, Disney fans. Heck, even Horace Horsecollar wears a Captain America t-shirt from Target in the new short, "Get A Horse." 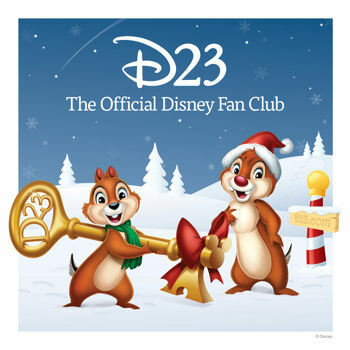 So one thing I neglected to put in the gift guide podcast this year, because it really had not occurred to me, was this: membership in the official Disney Fan Club. Some people aren't fan club types, that's true. And to date, I've only joined one myself, and that was to become a Blue Blaze Irregular. Nope, I wasn't even part of the Merry Marvel Marching Society nor F.O.O.M. (Friends Of Ol' Marvel). But Disney keeps tempting me. So I'll be honest: I'm going along with the recommendation because yes, it's on my own Christmas list. This isn't a paid endorsement -- this is something I think is cool and I'm looking into myself. To help you save during the holiday season, D23 Free Member discounts include the ABC TV Store, Brookstone, SuperShuttle, and a special offer on Disney Magazines. But perhaps more exciting for many Disney fans, Membership gives guests exclusive access to special in-depth content on D23.com. The site is updated daily with news about Disney theme parks, live-action features, animated films, television shows and celebrities. There are behind-the-scenes exclusives from the Walt Disney Archives, including never-before-released photos taken personally by Walt Disney. For kids of the ’90s there’s a celebration of the Disney Afternoon. And for fans of Disney TV shows today, there are exclusive interviews with stars of Once Upon A Time and Phineas and Ferb! The site also features the complete Disney A-Z, with more than 7,000 entries from the Disney encyclopedia.